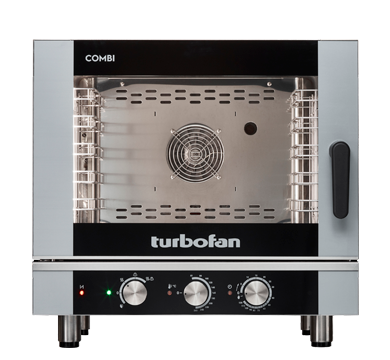 Dimensions W 32" x D 28-5/8" x H 31-3/8"
Dimensions W 32' x D 28-5/8" x H 31-3/8"
The Turbofan E40D5 combi offers hassle-free Touch & Cook functionality. With five GN 1/1 tray capacity within its compact 812mm / 32″ wide footprint, place it in the open kitchen or tuck it away in the bar area and take your kitchen to a new degree of productivity. The easy to understand icons allow you to start straight away and with a handy memo-board to make note on any specific cooking requirements for future use. Digital combi ovens also includes an automatic cleaning system with replaceable liquid cartridges for easy cleaning via simple selection of cleaning cycle modes.